The Oliva Serie V Cigar line is a simply superb Nicaraguan cigar, blended to deliver full body taste while maintaining an unparalled smoothness. 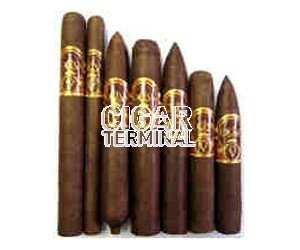 Rated among the top 25 cigars of 2007 by Cigar Aficionado Magazine; crowned 'Nicaraguan Cigar of the Year' and rated a massive 94 by Cigar Aficionado.The Oliva Serie V Cigar line is a simply superb Nicaraguan cigar, blended to deliver full body taste while maintaining an unparalled smoothness. This flavorful blend exhibits complex tobacco with rich coffee and dark chocolate tones. A subtle and well balanced spice is present throughout. This unique sampler includes one each of all the Serie Vs including the Churchill Extra, Lancero, Figurado, Torpedo, Double Toro, Belicoso, and Double Robusto.